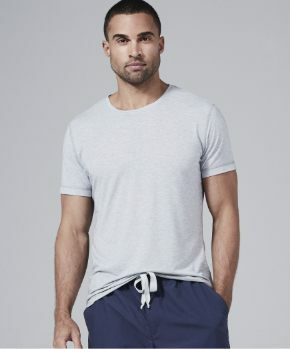 It may surprise you to learn that historically — and up through the late 19th century — doctors actually didn’t wear white at all; in fact, they only wore black. The black garments of the doctors of the past not only signified their somber, serious presence that, let’s face it, was pretty much associated with death most of the time, but they also served the pretty practical function of disguising dirty garments and all of the messy stains of the profession. As the medical profession (thankfully) advanced beyond bloodletting and things like germs were discovered, the American Medical Association describes how there was a push to remake how doctors appeared to the public. Out with that black look of death and in with the clean, sterile look. Hospitals made the switch to equipping their beds with fresh, new white sheets, nurses topped their hats with white caps, and doctors donned fancy new white coats meant to restore the public’s trust in them and their new handwashing skills. Sure, the black coat may have been a little more practical in terms of hiding stains or ushering a patient to the other side, but the white coat become an overarching symbol of the new face of medicine. The shift happened relatively quickly, as two famous paintings by Thomas Eakins famously depict, one portraying an operating theater of doctors all dressed in dark coats in 1875 called “The Gross Clinic,” and the second, in 1889 called “The Agnew Clinic,” with doctors all wearing white coats. 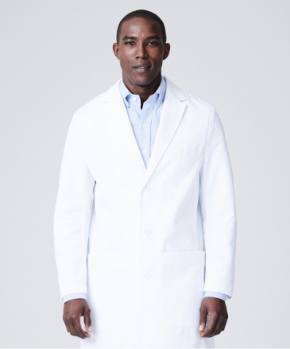 No one is 100% sure where the first white coat came into the picture or who exactly designed it, but it is clear that the white coat became synonymous with portraying the doctor as a clean, safe source of authority in the new-and-improved medical field and that image has never really left. And thus, the iconic doctor’s white coat was born. 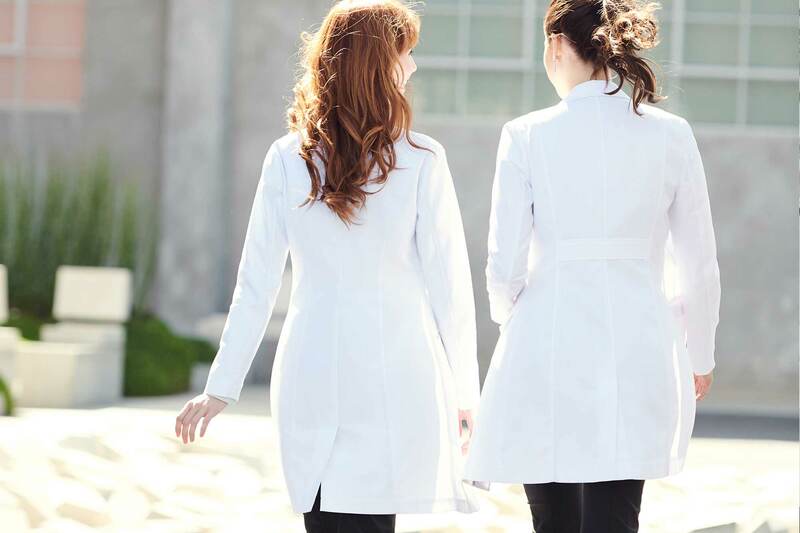 Now, however, the medical profession has only continued to evolve and a lady’s white coat is just as synonymous with a source of medical authority as the male lab coats of the past. 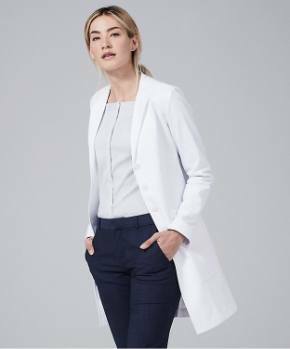 And while lab coats in the past were made to fit only a man’s body, companies that design lab coats for women that are tailored to fit a woman’s body with different sizing options, fabric that both stretches and holds its form, and is actually comfortable for them. However, many patients still find comfort in the symbol of the white coat for medical professionals, so it remains a central figure in patient-centered care. Thankfully, however, today’s medical professionals do have choices. 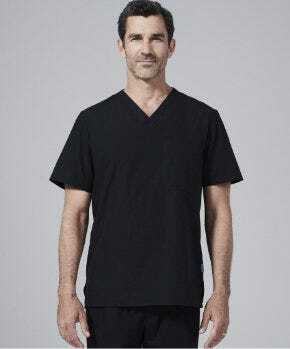 In fact, doctors, nurses, nurse practitioners, and physician assistants can have the best of both worlds, with practical, comfortable scrubs that can function in the role of hands-on patient care and professional lab coats that have a modern fit and quality material. 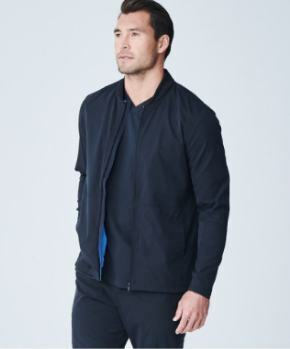 So, the white coat will continue to live on, but that doesn’t mean that it also can’t continue to get even better.